Hillcrest Cottage stands on an elevated site on the edge of the village of Low Row in Upper Swaledale. The cottage is detached and its enviable position affords stunning views of the patchwork of walled meadows with the high fell beyond. 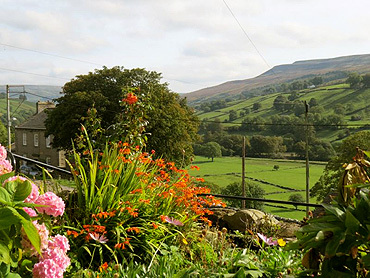 Low Row, in the very heart of Swaledale, is the ideal base for a relaxing holiday in one of Yorkshire's most dramatically beautiful and unspoilt dales. The Punchbowl Inn, renowned for its outstanding cuisine and friendly ambiance is just a short stroll away (less than 5 minutes). 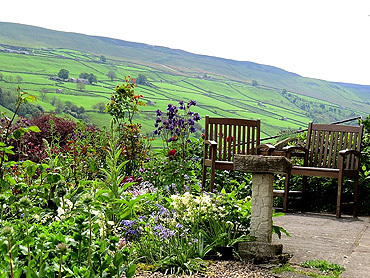 The village of Reeth, often referred to as 'the gateway to the dale' is a mere 4 miles away. 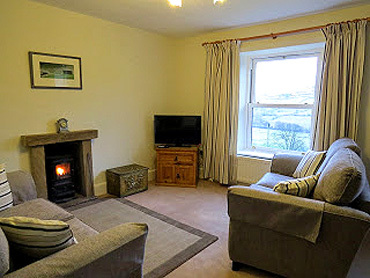 Hillcrest sleeps 5 in 3 bedrooms, has 2 bathrooms, kitchen, dining room, utility / boot room and the most charming first floor sitting room with wonderful views of the dale. With emphasis on guest comfort all our beds have top quality mattresses, dreamy duvets and luxury linen to ensure a good night's sleep. 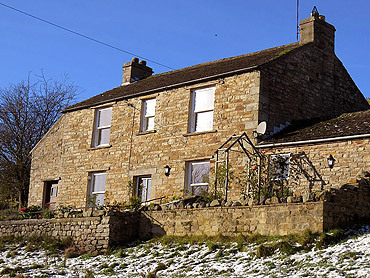 Full central heating, log burning stoves, south facing garden and parking. "landscapes to make the heart soar: hay meadows interlaced with dry stone walls and dotted with stone barns..."
Hillcrest Cottage is south facing has the rare privilege of standing quietly on an elevated position yet still being with a village setting. The uninterrupted views from the cottage take your breath away and simply make you want to 'stand and stare'. The first floor sitting room; charming, light and airy is everyone's favourite and the perfect place to relax after a day out exploring the dales. Hillcrest is surrounded by common land on which local farmers graze their sheep. They wander right up to the cottage boundary providing an added interest to your holiday. 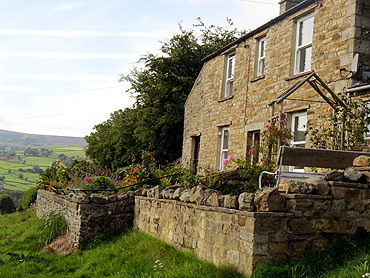 Hillcrest Cottage is ideally situated for exploring the miles of walking paths in and around Low Row and Reeth including several paths adjacent to the abandoned lead mining buildings at Surrender Bridge and Old Gang. The newly opened Swale Trail starts (or finishes) in Reeth but you can pick it up at both ends of Low Row by crossing the river at Low Whita bridge or Isles bridge. 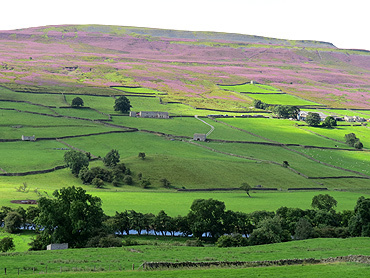 The Swale Trail at the Reeth end of the dale is particularly family friendly with kind-on-the-legs paths plus bridleways and back roads that rarely see a vehicle. Fremington Edge takes you up onto the moors above Reeth whilst the walk following Arkle beck is less challenging. There are lots of walking guides, maps and booklets in the cottage to help you get your bearings. But we have more to offer than just walks! There are many fabulous family days out within easy reach of Hillcrest. The Wensleydale Creamery experience in Hawes tells the story of cheese making in the dales and Bolton Castle has falconry, armoury and wild boar! But for a truely wizard day out visit the Forbidden Corner near Middleham. Quite honestly words cannot describe this fantasy playground in the depth of the countryside with shocks and surprises round every corner. A guaranteed day to remember! "We arrived in probably the worst weather you could hope for, rain coming in sideways, the River burst over it's banks flooding the roads in and out - what a start! We unpacked the cars, got the fire going, got some food into the oven and within minutes we started to simply unwind and relax in this amazing cottage. The cottage has everything you could possibly need"
"Excellent accommodation, in a absolutely ideal location for walking, cycling and sightseeing. The views from this elevated cottage are fantastic, the cottage itself is very spacious but yet warm and cosy. 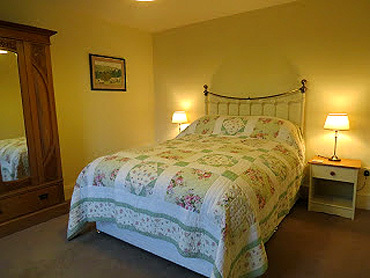 The beds are extremely comfortable, snugly and warm for a restful sleep. Thank you for sharing your wonderful cottage with us, we can't wait for our next holiday at Hillcrest." "Hillcrest is in a lovely position with great views from nearly all the rooms. It is well equipped, well furnished, clean, warm, has very comfy beds and is very quiet. We had a meal at The Punchbowl Inn where we were made very welcome and it was a very convenient short walk away from the house, so no disagreements about who was driving. Low Row is in such a good position "
It is 40 years since the BBC t.v. series All Creatures Great and Small was first broadcast and almost 50 years since the first James Herriot book appeared on the shelves however interest in the Yorkshire vet has not faded. A lot of filming for the t.v. 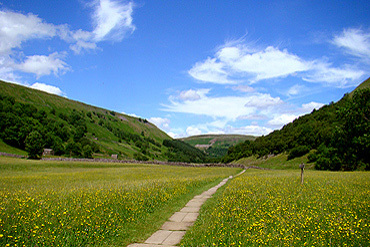 series took place in Swaledale. There are plenty of locations to visit nearby. Drive through the famous water splash as seen in the open sequence of the television programme. Have a pint in the Red Lion in Langthwaite and browse the gallery of photographs of actors and actresses so familiar to All Creatures Great and Small fans. Pop over to Askrigg and find the fictional Skeldale House and the Drovers Arms. For true fans a trip to the World of James Herriot in Thirsk is a must and makes a great day out. Closer to home visit the set of James Herriot’s Darrowby surgery as used in the t.v. series in the Richmondshire Museum, Richmond. 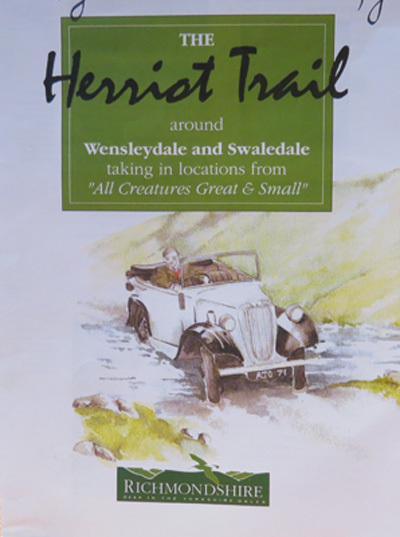 Swaledale was Alf Wight’s (the real James Herriot) favourite dale. When he was poorly his son drove him to a best loved spot where he had a panoramic view of this beautiful dale. Double bedroom with views over the garden and hills beyond. Dining/sitting room with log burning stove, extendable oak dining table with chairs, antique dresser, television and DVD player - this is a great room for enjoying your morning coffee and reading the papers. 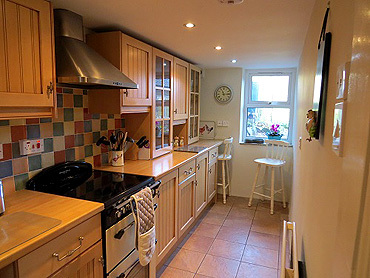 Up two steps takes you to... Well appointed galley kitchen with dishwasher, range style cooker (electric), fridge/freezer and a good range of cupboards with good quality crockery and cookware. Off the kitchen is... Downstairs shower room with WC, wash basin and under floor heating, along with the utility room and rear entrance. The main sitting room sits on the first floor providing an elevated position to enjoy the spectacular views over the dale out of its two windows. 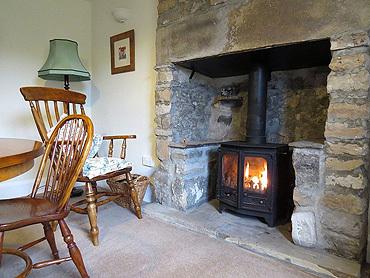 The little log burning stove and two comfy sofas provide the perfect place to unwind after a day's walking. Master bedroom with king size bed and more of those fantastic views over the dale. Single bedroom. Family bathroom. Parking for one car is immediately outside the cottage with plenty of space for other cars nearby on the common. The garden provides a pleasant place to relax in the warmer months with well stocked borders, flagged patio area and garden furniture. Surrounded by common land which is often grazed by sheep and at times cows, the garden is a great place to sit back and watch all that is going on around. 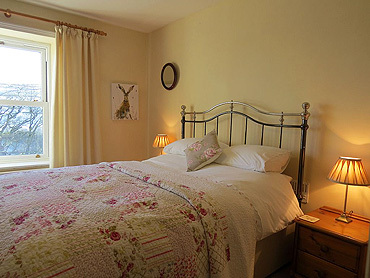 Hillcrest offers a ground floor bedroom, shower room with WC and sitting area, making it suitable for guests with limited mobility but unfortunately not suitable for wheelchair users. The stairs are open plan from the dining room up to the first floor sitting room and there are two steps from the dining room into the kitchen which then leads to the shower room and two further steps to the rear entrance. Entrance to the cottage via the front door is level.